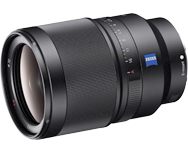 We continue our optical analysis of Sony’s latest FE-mount lenses, this time examining the performance of the $1598 Sony Carl Zeiss Distagon T* FE 35mm F1.4 ZA. A professional-grade “fast” aperture wide-angle prime, the new lens is specifically designed for use on Sony A7 hybrid cameras. Including three aspherical lens elements and Zeiss T* coatings for enhanced image quality, let's hope for great results as we run though our industry standard tests.